2014 BMW 3-Series Gran Turismo Pros and Cons: Why (Not) This Car? In the late 1990s the powers that be within General Motors had an insight: "segment busters." Cars that didn't fit any traditional segment would better suit the needs of an increasing number of car buyers and, lacking direct competitors, would be much more profitable. Unfortunately, most of the vehicles that followed from this strategy (Chevrolet Malibu Maxx, Pontiac Aztek, GMC Envoy XUV) flopped and none (including the somewhat successful Chevrolet Avalanche) are still with us. BMW is betting that GM just didn't do it right. While the brand will continue to offer conventional coupes, sedans, and crossovers, each of its major car lines has been joined by an unconventional offshoot. This grand strategy began with the 2008 X6, a crossover with a coupe-like roof line. It continued with the 2010 5-Series Gran Turismo (5 GT), a tall, extended wheelbase hatchback, and 2013 6-Series Gran Coupe (6 GC), a 6-Series coupe with a longer wheelbase and two additional doors. For the 2014 model year the compact 3-series sedan, 4-Series coupe, and X3 crossover gain derivatives along the same lines. Of the bunch, the 3-Series Grand Turismo (3 GT) is the most promising. Though priced the same as a 3-Series wagon, the 3-Series Gran Turismo is 7.2 inches longer (for a solidly midsize 189.2) and 3.1 inches taller (at 59.2 still a half-foot lower than an X3) on a 4.4-inch longer wheelbase (for a 5-Series-like total of 115.0). Only in width (72.0 vs. 71.3 inches) does the GT remain 3-like. But what to compare the 3-Series Grand Turismo to? The Audi A5 Sportback isn't offered in the U.S. The Honda Crosstour and Toyota Venza, though similar in concept, are both taller, wider, and devoid of the BMW's performance or upscale ambitions. Then my mother went shopping for a new station wagon, and the Mercedes-Benz E350 seemed her only option. Might a 3 GT be not only an option, but a better one? Don't care for the combination of red leather and aluminum trim? Other combinations are possible. Why the 2014 BMW 3-Series Gran Turismo? You sit a little low in the 3-Series sedan or wagon. To get a better view over the instrument panel, I raise the driver seat. In the 3-Series Grand Turismo, no such adjustment is necessary. The lowest seating position puts all but the shortest drivers well above the instrument panel. A taller windshield makes for a more open view forward. None of the pillars are thick, so visibility to the rear and sides is also about as good as it gets in a car these days. Why anyone buys a BMW in base or Luxury Line trim escapes me. The seats in those cars are flat and provide little lateral support. The sport buckets included in the Sport Line and M Sport Line (tested) are both more comfortable when cruising and much more supportive when the road curves. Their side bolsters can be adjusted to fit torsos of varying breadth. The $660 "Active Multicontour Driver Seat" in the E-Class performs a couple of additional tricks. The bolsters can be set to automatically motor inwards when the steering wheel is turned. Though rather silly when this occurs in a parking lot (the programming should take vehicle speed into account), it's reassuring, even encouraging, when flogging the car along a twisty road. Meanwhile, you can be receiving one of four levels of massage (slow and gentle, slow and vigorous, fast and gentle, or fast and vigorous). This would be "advantage Mercedes," except that only the driver seat gets these features. Your passenger will be happier (both with the adjustable bolsters and the more equitable treatment) in the BMW. Higher roof, longer tail make for a design challenge. Very BMW instruments and controls. Clear, but quite severe compared to competitors. Large display. What the specs don't tell you is that the 3 GT's rear seat cushion, since it is positioned much higher than that in the wagons, provides better thigh support and a much more open view forward. To top it off, the 3 GT's rear seat back reclines. Here again, though, the E-Class wagon has a trick bonus: a rear-facing third-row seat. Though there's not enough headroom back there for anyone over 5-4, the seat is well-padded. If you want to seat seven in a pinch, the E-Class wagon is your only option with a sedan-like driving position (aside from the Tesla Model S). Update: this review originally stated that the 3GT has much more shoulder room than the regular 3-Series, and about as much as the E-Class. But it seems that the initial specs were inaccurate. The latest specs suggest shoulder room in the 3GT is about the same as that in the regular 3-Series. Its interior does feel significantly roomier, though, so the initial specs could yet provide the more accurate set. I wavered on whether to make handling the #1 reason to buy a 3-Series Gran Turismo. You won't find a car with similar interior volume that handles better. Even in Sport form the E-Class wagon certainly doesn't, with feather-light steering and a touch of float over undulating pavement. In base form recent BMW's body control falls short of that of the Mercedes. But the suspension fitted with the Sport and M Sport Lines fixes this. Typical of BMWs, the 335i Gran Turismo M Sport Line feels better the harder you press, its impressive balance and composure abetted by accurate steering. So why isn't handling in the top slot? Partly because the 3 GT's handling isn't quite up to that of the other 3s. Blame a higher center of gravity and greater curb weight (4,010 vs. the AWD 335i's 3,760 lbs). The latter can be reduced by nearly 100 pounds where it is least wanted, over the front wheels, by opting for the four-cylinder 328i Gran Turismo instead of the tested six-cylinder 335i GT. Also blame mandatory all-wheel-drive (which contributes to that two-ton curb weight). While BMW's rear-biased AWD system retains some of the dynamic feel of a rear-wheel-drive car, some is not all. No doubt most people would opt for all-wheel-drive anyway (which is why it's also standard on the Mercedes), but it would be nice to have rear-wheel-drive as an option. Most of all, though, I can't warm to the steering in any of the current BMWs. Though progressively weighted, the thick leather-wrapped rim communicates very little, and generally feels numb. Switching the chassis from "comfort" to "sport" (using the buttons conveniently located to the left of the shifter) bumps steering effort from overly light to a touch heavy, but has little impact on the amount of feedback. Many reviewers will simply blame the source of power assistance, an electric motor instead of a hydraulic pump. But the latest Cadillacs deliver much more nuanced steering feel with electric assist. Ditto some much less expensive Mazdas. The tested 335i GT was fitted with the optional Dynamic Handling Package. Though the $1,000 price is reasonable for the included variable ratio steering and adaptive dampers, these features don't seem to make a dramatic difference. Also, with the adaptive dampers neither the comfort nor the sport setting feels quite right. There's a bit much float in the former, a bit much impact harshness in the latter. The standard sport suspension might strike a better balance than either. So try to check out the effects of this option yourself before spending your money on it. Theoretically, the Mercedes-Benz E350 wagon's 3.5-liter V6 engine has a slight edge in horsepower over the BMW 335i Gran Touring's turbocharged 3.0-liter inline six, 302 to 300. In reality, the two aren't so close. Part of the reason: the Benz V6 has to motivate a couple hundred more pounds. Most of the reason: the BMW mill is under-rated--it produces more than its stated horsepower. Even if this weren't the case, turbocharged engines are stronger at low-to-middling engine speeds. They've got more grunt down low (at least once the turbo spools up, a blink or two these days). In Car and Driver's testing the BMW with a "street start" (no burning rubber) got to 60 in 6.1 seconds, the Mercedes in 6.6. Not a huge difference, but a significant one. More indicative of the difference between the two engines is what happens over 60: the BMW was three seconds quicker to 100, five seconds quicker to 120. You don't drive this fast? Me, either. But these stats indicate how much more powerful the BMW really is. The inline six sounds sweeter when revved, too. Frankly, few people will often tap the full potential of the boosted six. If you won't, and can also live with a lumpier idle and somewhat dieselish engine noises, I'd suggest saving $4,100 and getting the 328i Gran Turismo instead. With the 240-horsepower turbocharged 2.0-liter four-cylinder engine the 3 GT should still be about as quick as the Mercedes. Both cars have responsive, well-behaved automatic transmissions, with the eight-speed in the BMW having a slight edge over the older seven-speed in the Mercedes. A manual transmission is available in neither car. Why Not the 2014 BMW 3-Series Gran Turismo? I don't doubt that BMW interiors have their fans. But I cannot imagine someone like my mother driving a 3-Series Gran Turismo largely because, even with red seats, there's no warmth inside. Saddle brown leather seats inject a bit of it, but aren't available in conjunction with either sport package. Munich has softened the cars up in many ways to broaden their appeal--they want to sell a car to my mother--but their interior styling remains coldly technical, especially the area directly in front of the driver. If this atmosphere appeals to you, then by all means move interior styling out of the "why not" column, maybe even to the "why" column. But many people will be turned off by it. For them, the glitzier, more lavishly trimmed Mercedes interior (which both looks and feels more expensive) will have more appeal. The BMW 3-Series Gran Turismo, with its longer wheelbase, does ride more smoothly than other 3s. My initial impression, after driving a Cadillac CTS the previous week, was that it rides more smoothly and steadily than that car (when similarly fitted with an adaptive sport suspension) as well. Yet after a few days I found myself becoming annoyed with the ride of the car. Little in the way of harshness, but a fair amount of jostling on some pavement. Bear in mind that the Detroit-area roads have been badly damaged by an unusually severe winter. Some are nothing but potholes and frost heaves. No car rides well on these roads. But some cars ride more smoothly than the BMW, the Mercedes among them. The tested car had 18-inch all-season tires. You can also get 18-inch summer tires or, for another $900, 19-inch summer tires. Based on comparison drives in various 3-Series sedans, the 19s ride much more firmly than the 18s while having few, if any, advantages. I'd keep my $900. Both cars are fairly quiet, with the Mercedes having a slightly more luxurious quality to the sound that does reach your ears. A BMW 5-Series is quieter than either. The BMW "kidneys" can't grow much more. M Sport Line adds this aggressive front fascia. Rear seat surprisingly comfortable and roomy. If you want a feature, you can probably get it on the BMW 335i Gran Touring. But there are exceptions. I've already mentioned that an automatic transmission and all-wheel-drive are mandatory, and that a third-row seat is only available (and standard) in the Mercedes. You can also only get a lane keep assist feature that can nearly drive the car in the Benz. But the feature most likely to be missed on the BMW--and a cheap, low-tech one at that--could be a rear wiper. These are standard on nearly every other hatchback or wagon, but one isn't even optional on the BMW. People generally dislike, even loath the exterior styling of the 5-Series Gran Turismo. Unlike with Audi's large-ish sedan-based sporty hatchback, the A7, functionality was accorded a higher priority than aesthetics, so the large BMW GT's proportions are rather frumpy. BMW achieved slightly more athletic proportions with the 3-Series Gran Turismo, and the smaller GT doesn't seem to be inspiring nearly the same level of vitriol. The car looks best from low angles (which were used for most of the photos here), so it's possible that impressions of the car's beauty (or lack thereof) vary inversely with the height of the beholder. Whatever the viewing angle, functionality appears to have been a high priority. Compard to other 3s, the GT is taller and has a longer rear overhang. So while fewer people will reject the 3 GT based on how it looks, few people are likely to buy one primarily because they like how it looks, either. Even if (for some reason) the door glass is frameless, coupe-style. The Audi A5 Sportback, with a lower, sleeker roof line, is a much more attractive car. But its rear seat is far tighter, which partly explains why it's not offered on this side of the Atlantic. If this is a trade you'd be willing to make, BMW will be offering the 4-Series Gran Coupe later this year. Like the 6-Series Gran Coupe, the 4 GC will pair the front end of a 2-door coupe with a longer wheelbase and a second set of doors. Unlike the 6 GC, but like the 3 GT, the 4 GC will be a hatchback. It's price could be very close to that of the 3 GT, so we could end up with an interesting test of how people prioritize styling and functionality. I'm not a huge fan of the Mercedes-Benz E350's styling. There's nothing very wrong with it, just nothing very right with it, either. It's thoroughly conventional, and not at all exciting. To be fair, the E-Class isn't supposed to excite the senses. For that Mercedes offers the related CLS. Since the 3-Series Gran Turismo's fast rear roof line doesn't render it strikingly attractive, one must wonder why they didn't just make the car a wagon, or at least extend the roof a little farther rearward before angling it down, sport wagon style. As is, there's not much space for cargo above the base of the windows. But that space wouldn't be needed often anyway, right? How often do you pack a vehicle well above the base of the windows? The 3 GT's cargo floor is quite long (that stretch paying off, again). Official specs put 3 GT's cargo volume just above the 3-Series wagon and just below the E-Class wagon: 18.3 vs. 17.5 vs. 20.5 cubic feet with the rear seat upright and 56.5 vs. 53.0 vs. 57.4 cubic feet with it folded. However, cargo volume specs are especially susceptible to varying methods of measurement. If all three cars' capacities were measured to the roof (the Mercedes certainly wasn't), then the E350 wagon would have a much larger advantage. When you consider that these cars weigh over two tons and have 300-plus-horsepower engines driving through all four wheels, their middling fuel economy ratings--20 mpg city, 30 mpg highway for the BMW, 21/29 for the Mercedes--are actually quite impressive. The real-world trip computer averages weren't quite as good as the EPA ratings. In suburban driving with some traffic, the trip computer reported averages as low as 17. But with a light foot and no traffic it reported as high as 26, and low 20s were typical. Cruising on a 70-mph highway with the tach indicating 2,000 rpm the average barely topped 30. All of these readings were recorded with the outside temperature well below freezing. In warmer weather they would have been a least a couple mpg higher. The 328i Gran Turismo earns better ratings, 22/33. In my experience the fuel economy difference between BMW's four and BMW's six is larger than these ratings suggest. If fuel economy is a top priority, get the 328i rather than the 335i. Either engine is equipped with a defeatable automatic start / stop system that cuts off the engine when stopped at a light, then restarts it when you lift off the brake. This system operates much more smoothly in the 2014s than it did in the 2012s. It was also surprisingly tempting to list price among the "why to buys" for the 3 GT. The tested car, with most but not all options, listed for $60,250. Even with no options the sticker comes to $47,775. Far from cheap. But drop a few features not offered on the Mercedes (adaptive dampers, sport brakes, head-up display) and include a few safety features on both cars (I'm a sucker for around-view camera systems), and the 335i Gran Turismo checks in a substantial $14,445 below the E350 wagon, $59,050 vs. $73,495. As configured, the Mercedes does include about $2,400 worth of additional features. Adjust for these, and we still have a difference over $12,000. Switch to the 328i Gran Turismo, and the BMW's advantage swells by another $4,100. Real money. The challenge for BMW: since there's nothing else like the 3-Series Gran Turismo, and since it doesn't fit into any conventional category, few people will know to check one out. People usually start with, "I want a sedan" or "I want a crossover," not "I want something taller and roomier than a sedan but lower than a crossover." Even with a nudge from me, my mother bought the E350 wagon, not the 3-Series Gran Turismo. I can easily understand why. The Mercedes has a warmer, more luxurious interior, a smoother ride, and more conventional styling. She's just not a BMW driver. And she wanted a wagon, complete with a third-row seat (that will rarely be used). Then my best friend called. His Mercedes-Benz C-Class is too tight inside, and he'd like to sit higher. We discussed various possibilities among upscale crossovers, but he doesn't really like how crossovers drive. Then it dawned on me: the 3 GT could be just the car he's been looking for. The things that are "why nots" for my mother aren't "why nots" for him. If you'd also like a BMW 3-Series that sits a little higher and has a roomier rear seat, for the same amount of money, then the 3 GT could be the right car for you, too. Powerful, smooth, and makes good noises. But 328i's four cylinder is more efficient and costs less. Specs suggest there's nearly as much volume here as in an E-Class wagon. Eyes disagree. BMW provided an insured car for a week with a tank of gas. Adam Locke of Autobahn Motors in the SF Bay Area provided the E350 wagon. He can be reached at 650-888-1059. 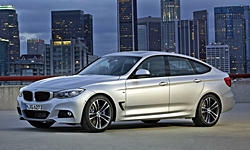 2014 BMW 3-Series Gran Turismo pros and cons, according to Michael Karesh: the best reasons for buying (or not buying) the 2014 BMW 3-Series Gran Turismo. Join TrueDelta to post your own impressions.